This page may require cleanup to meet basic quality standards. The specific problem is: FS2Open information is lazily copy-pasted mess.. You can help by modifying the article. The discussion page may contain useful suggestions. FS2Open is a modern source port for Windows, OS X and Linux. All versions of the game can be played on OS X and Linux using FS2Open. The latest retail patch is v1.02; digital distribution versions already include this. 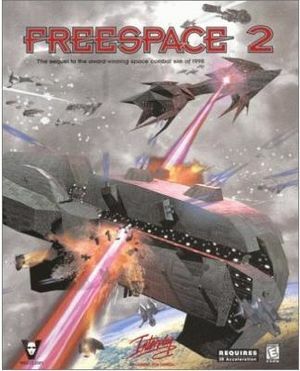 An unofficial port of Freespace 2 is available here. The installer and the source code of the port itself is available. Keep in mind that the installer is not compatible with GOTY/Sim and non-English version. FS2Open is an open source port for Windows, OS X and Linux. It features improved graphics, mod support, mutli-platform support, improved mission scripting, lua scripting, optimizations, and various bug fixes. Improved Graphics: FSO adds shader support to the Freespace's rendering pipeline to implement soft particles and other effects. Support for Normal Mapping, Environment Mapping, Glow Mapping, Skyboxes and soft shadows have been added. Mod Support: Mods can now be installed and read without altering game files. Only a launcher is required to implement an installed mod, and multiple mods can be installed within the Freespace folder. Multi-platform support: FSO enables Freespace to be run in Windows, OS X, Linux, and (experimentally) in FreeBSD. Multi-platform compatibility is maintained on all stable FSO releases. Mission Scripting: FSO more than doubles the available functions (known as SEXPs) that can be used in mission creation, including in-game cutscene controls. It also allows the mission creator to disable Briefings and Debriefings or add Fictional text to the mission. Lua Scripting: Lua scripting has been added to accomplish things that the regular functions cannot and also alter the state of the game outside of missions. Optimizations: The FSO engine has been optimized to make more complex models and textures usable and improve CPU performance. Bug Fixes: Since the beginning of the FSO Source Code Project (FSOSCP), over 2000 bugs have been reviewed and fixed or explained. FS2Open helps install various popular mods including a port of Descent: FreeSpace – The Great War. -fov flag in the Community launcher command line (format: -fov #.##). Community recommendations are for a value of 0.39. Will need to disable VSync and perhaps enable 'Don't limit frames-per-second' in the launcher under Game Speed. Then FPS will be completely unlimited. Effects, Music and Voice. Briefing voice overs can also be disabled. ↑ 1.0 1.1 File/folder structure within this directory reflects the path(s) listed for Windows and/or Steam game data (use Wine regedit to access Windows registry paths). Games with Steam Cloud support may store data in ~/.steam/steam/userdata/<user-id>/273620/ in addition to or instead of this directory. The app ID (273620) may differ in some cases. Treat backslashes as forward slashes. See the glossary page for details.